Super Auction- Ethiopian Welo Opal Premium size(Ovl 13x10 mm), Diamond Ring in Rhodium Overlay Sterling Silver 3.070 Ct.
Super Auction- Ethiopian Welo Opal (Ovl 13x10 mm), Diamond Pendant With Chain (Size 18) in Rhodium Overlay Sterling Silver 3.370 Ct.
5.83 Ct Ethiopian Opal ,Russian Diopside and Tanzanite Halo Pendant with Chain in Sterling Silver 7. Ethiopian Welo Opal (Ovl), Natural Cambodian Zircon and Russian Diopside Pendant With Chain (Size 18) in 14K Gold Overlay Sterling Silver 3.000 Ct.
Opal is a very mysterious gemstone, with a very spooky history, making it a perfect gem for October. Derived from Greek word ‘Opalus’ meaning change in colour, Australia’s national gem is highly adored for its stunning colour formations. Often referred to as ‘precious’ - this gemstone makes light diffract, thus taking on many colours. Opal takes on colours ranging from clear through to white, grey, red, orange, yellow, green, blue, magenta, rose, pink, slate, olive, brown, and black, however, black opals are the rarest and most sought after. Early Romans believed that Opal was combination of the beauty of all precious stones and even ranked them second to Emeralds. It was also considered to have possess magical powers and given as gifts as a token of good luck, purity and hope. But, for many years, Opal has been thought to be a stone of bad luck - if you believe in superstitious folklore! In the East, people thought Opal enhanced psychic abilities. Europe was also once supplied with Opal and superstitious beliefs about the stone rose as it was thought to be a talisman for thieves and robbers, while many believe it resembled the evil eye. Despite bad connotations, early races credited the magical stone to amplifying and mirroring feelings, burying emotions and desires, while being able to lessen inhibitions and promote spontaneity. Shakespeare even attributed Opal as “that miracle and queen of gems”. Originally found in the Middle East, this beautiful gem is usually set in jewellery, cut and polished into cabochons, for people to enjoy, much like the Opal jewellery seen on TJC, just take a look and explore our vast variety of Opals including; Fire Opals, Ethiopian Welo Opal, Australian boulder opal and Peruvian pink opal to find something you’ll fall in love with. No two opals are the same, making them a great individual gift, while the range of colours available means they can be suited to a range of personalities and styles. 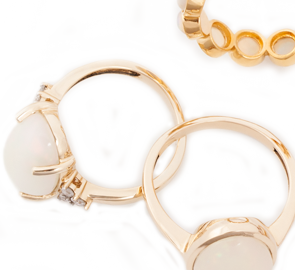 Just like diamonds, opals can be worn with practically anything, allowing you to add a touch of luxury to everyday styles as well as evening ensembles. Delve into our magical range now and treat yourself to something which you always call for no matter the occasion, whether it’s a pair of extravagant Opal Earrings, a statement Opal ring or a stunning Opal Necklace , find something you love.